Ultra Low Switch on-Resistance: 4.5Ω, typ. HV2070 is a low harmonic distortion, low charge injection, 32-channel, high-voltage analog switch, which doesn’t require high-voltage supply. It is intended for use in applications requiring high-voltage switching controlled by low-voltage signals, such as medical ultrasound imaging and printers. The typical on-resistance is 4.5Ω, and switch to ground on/off capacitances are 20 pF and 11 pF, respectively. 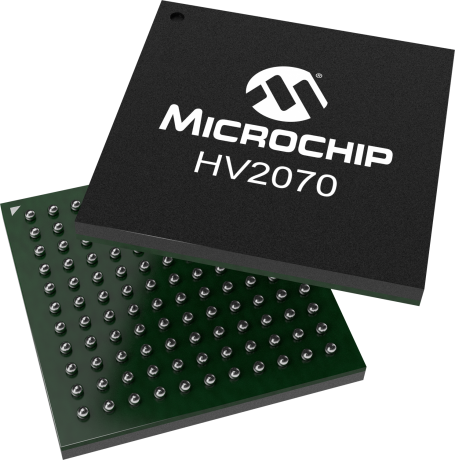 The low parasitic capacitance and low on-resistance make HV2070 suitable for applications such as ARFI and shear-wave elastography and High Intensity Focused Ultrasound (HIFU) which require higher current levels. The device requires only ±6V or ±5V low-voltage supplies, however the analog switches still can pass ±100V high voltage pulses. The HV2070 has two modes of operation: individual switching mode with 32-channel SPST switches, bank switching mode with 16-pole double throw (16PDT) logic. Bank switching mode is intended for probe selection. For further information, please contact Microchip sales office.